Draft: 2003, Los Angeles Dodgers, 18th rd. Andrew James Ellis...he and his wife, Cindy, have two daughters, Ainsley (5/8/08) and Audrey (10/12/12), and a son, Luke (5/29/10)...participated in a community event and filmed a public service announcement as a part of the Los Angeles Dodgers Foundation's partnership with Vision to Learn, a non-profit organization which provides free eye exams and free eyeglasses to elementary school students in low-income communities throughout the Greater Los Angeles area...represented the Dodgers in Sydney, Australia on a media tour to help promote the 2014 Opening Series...has penned guest columns for Los Angeles Times , ESPN.com and The Players Tribune ...his brother Josh was a pitcher in the Diamondbacks' system...selected by the Dodgers in the 18th round of the 2003 First-Year Player Draft out of Austin Peay State University and signed by Dodger scout Marty Lamb. Appeared in 51 games with MIA, batting .210 (30-for-143) with five doubles, six home runs and 14 RBI...Did not commit an error in 39 appearances at catcher (293 total chances)...In the Marlins' 6-5 victory over ARI on 6/4, he fouled off eight two-strike pitches before delivering a two-out seventh-inning RBI single that proved to be the game-winner...according to ELIAS, he was just third player since 1900 to drive in a game-winning run at end of at-bat lasting 14-plus pitches, joining MIA's Jose Lopez vs. OAK in 2009 (ninth inning), and CWS's Kevin Youkilis vs. KC in 2012 (14th inning)...Hit a two-run home run as pinch hitter in 11th inning on 7/9 at SF, marking his first career pinch-hit home run...Recorded a season-high three RBI on 9/27 at COL...was 3-for-11 (.273) overall as a pinch hitter, with a home run and three RBI...Miami went 17-19 in his starts in 2017. Combined to hit .216 (37x171) with eight doubles, two home runs and 22 RBI in 64 games between Los Angeles and Philadelphia...Appeared in 53 games with Dodgers, batting .194 (27x139), before being traded to Philadelphia along with RHP Tommy Bergjans and player to be named later on August 25 for Carlos Ruiz and cash considerations...With Phillies, appeared in 11 games and hit .313 (10x32) with three doubles, one home run and nine RBI...Made fifth consecutive Opening Day start on April 4 at San Diego, going 1x4 with a season-high three RBI. Also had three-RBI affairs on September 2 vs. Atlanta and Sept. 17 vs. Miami...Recorded season-high two hits on April 23 at Colorado, going 2x4 with two runs scored, one home run and two RBI. Equaled hit total six times over remainder of season...Made eight starts with Phillies after acquisition, batting .250 (2x28) as starter. In three games off bench, had three hits in four at-bats...Ended season hitting in each of last four games, with a .600 (6x10) average...Among National League catchers with at-least 50 games started, ranked fourth in catchers ERA at 3.38, behind David Ross (2.39), Rene Rivera (2.75) and Miguel Montero (3.16). Rebounded from a slow start to the season to hit .238 with seven homers and 21 RBI in 63 games in his eighth MLB season. ... From July 1-conclusion of the season, posted a .279/.394/.523 slashline, going 31-for-111 with six doubles, seven homers and 18 RBI in 37 games. ... Received the bulk of starts against left-handed pitchers down the stretch and batted .260 (20-for-77) with a .394 on-base percentage and .519 slugging percentage off lefties. ... Made 55 starts, catching Clayton Kershaw (21), Brett Anderson (11), Zack Greinke (6), Alex Wood (6), Brandon McCarthy (3), Mike Bolsinger (3), Mat Latos (3), Joe Wieland (1) and Carlos Frias (1). ...Ranked seventh in the Majors (min. 50 G) with a 3.37 catchers' ERA… threw out eight of 30 attempted basestealers (26.7%). ... Placed on the DL from July 20-Aug. 4 with right knee inflammation. ... Appeared in three games (two starts) in the NLDS vs. New York, going 2-for-8 at the plate. Reached double-digit home runs for a second consecutive season, clubbing 10 homers and posting a .238 batting average with 52 RBI in his sixth season with the Dodgers... Threw out 24 (3rd, MLB) of 59 potential base stealers during the regular season, good for a 44.4 caught stealing percentage (3rd, MLB)... Among qualifying Major League catchers, his 3.05 catcher ERA ranked second…made 109 starts behind the plate, the sixth-most starts among Major League catchers... Tied for third on the club with 52 RBI and ranked third with 45 walks... Among players with a minimum of 350 at-bats, ranked second in the Majors by seeing an average of 4.35 pitches per plate appearance... Had a career-long nine-game hitting streak from June 2-July 10, batting .385 (15-for-39) during the streak…the club went 9-0 during the run... Hit a walk-off single to right field that scored Hanley Ramirez on June 29…was his sixth career walk-off hit... Recorded his first career four-hit performance and also collected a career-high five RBI in a 14-5 win at Toronto on July 22... Excelled in Interleague play, batting .341 (15-for-44) with a homer and 11 RBI in 15 games against AL opponents... Started behind the plate for all 10 postseason games in the NLDS and NLCS, posting a .323 (10-for-31) batting average with a homer, triple, four doubles and three RBI in his first postseason action... His .323 batting average and .613 slugging percentage in the postseason was the highest for a catcher in franchise history. In his first full season as a starter, ranked 11th in the NL in on-base percentage and tied for 13th with 65 walks. Led the NL and tied for the big league lead with Adam Dunn by averaging 4.43 pitches per plate appearance. Collected at least one RBI in six consecutive games from Sept. 23-30, a career-long run and the longest streak by a Dodger this season. Established single-game career highs in homers (2, Aug. 3 vs. Chicago-NL) and RBI (4, May 13 vs. Colorado and Aug. 29 at Colorado), while tying his career high with three hits on three occasions (July 7 at Arizona, Aug. 3 vs. Chicago, Aug. 19 at Atlanta, three times in 2010). Led the team with three walk-off RBI, including a bases-loaded walk (May 18 vs. St. Louis), an RBI single (Sept. 3 vs. San Diego) and the first walk-off homer of his career, a three-run shot on May 26 vs. Houston. Ranked second on the club with 133 games played and ranked fourth in the Majors with both 131 games and 1151.0 innings caught this season...threw out 28 would-be base stealers, tying for the fourth most in the big leagues (28/74)...posted a .995 fielding percentage, which tied for the third-best mark among MLB catchers. Hit 13 home runs, his most at any level in his professional career with 11 coming against right-handed pitchers. Batted .290 or better in three months, doing so in April (.291), May (.333) and August (.291)His .277 batting average (77-for-278) out of the eighth spot in the lineup was the fifth highest mark among big leaguers...his seven homers tied for the second most out of that spot in the order among Major Leaguers. Blasted the first grand slam of his career with an eighth-inning shot off Rockies reliever Will Harris on Aug. 29 at Colorado. Reached base in 28 consecutive games from April 11-May 19, which tied for the seventh longest such streak in the Majors this season. Batted .448 (13-for-29) during his careerlong eight-game hitting streak from May 9-19. Walked four times on June 11 vs. the Angels, setting a new career high, and matched that on July 29 at San Francisco...became just the third Dodger in franchise history to walk four times in a game twice during the season (Duke Snider, Jack Fournier). Posted a 3.30 catcher's ERA, which was the third best mark in the Majors. Made his second career Opening Day roster (also 2011) and his first Opening Day start behind the plate on April 5 at San Diego. Voted by his teammates and coaches as the winner of the seventh annual Roy Campanella Award, which is given to the Dodger player who best exemplifies the spirit and leadership of the Hall of Fame catcher...was the second catcher to win the award as the "most inspirational Dodger," joining Russell Martin (2007). Saw action in 31 games and hit .271 (23-for-85) with two homers, a double, a triple and 11 RBI...Appeared in 29 games (25 starts) behind the plate and did not make an error...Slugged his first Major League home run on Aug. 24 at Busch Stadium off the Cardinals' Jaime Garcia...homered again in Atlanta off Mike Minor on Sept. 3...Hit his first-career triple at Arizona in the second-to-last game of the season on Sept. 27...Batted .360 (9-for-25) with two homers against left-handed pitching...Hit. 435 (10-for-23) in day games...batted .407 (11-for-27) in the seventh inning or later...In 12 September games, hit .323 (10-for-31) with a homer and four RBI...Went 1-for-2 as a pinch-hitter and his .392 on-base percentage ranked second on the team...Hit .304 (56-for-184) with two homers, 28 RBI, 50 walks and a team-best .467 on-base percentage over 59 games for Triple-A Albuquerque. Established career highs in every single offensive category and played in a career-best 44 games ... caught 43 games (34 starts) ... Hit .278 (30-for-108) with five doubles, 16 RBI, 14 walks and a .363 on-base percentage ... Began the season at Triple-A Albuquerque, but was quickly promoted to back up Russell Martin onApril 10 when Brad Ausmus went on the disabled list ... From April 10-July 20, hit .204 (10-for-49) in 19 games (15 starts) ... was optioned to Triple-AAlbuquerque on July 21, but was quickly recalled on Aug. 4 when Russell Martin went on the DL ... made seven starts and hit .217 before getting optioned once again on Aug. 22 ... Was recalled for a third time on Sept. 5 and hit .417 (15-for-36) with two doubles and six RBI overhis final 16 games, raising his average 70 points during that span ... Batted .714 (10-for-14) during his career-long five-game hitting streak from Sept. 11-21 ... went7-for-8 in the three-game series against Colorado that weekend becoming the first Dodger to go7-for-8 or better in a series (.875 BA or higher, min. seven hits) since Jim Gilliam went 7-for-8 in atwo-game series at Chicago in August 1959 ... the last MLB player to turn the trick was Pittsburgh'sFreddy Sanchez (8-for-9) in a three-game series at Chicago in May 2009 (Source: Elias) ... Batted .364 (12-for-33) with runners in scoring position and hit .286 (14-for-49) with runnerson base ... Collected two walk-off hits in the 11th inning this season: Sept. 19 vs. Colorado and June 6 vs.Atlanta ... Hit .364 (20-for-55) in 19 home games and batted .359 (14-for-39) in 14 day games ... Stroked a single in the seventh inning and a double in the ninth inning on April 17 for his first careerextra-base hit in his first career multi-hit game ... Had three three-hit games on the season ... cracked a career-high two doubles on Sept. 17 ... Posted a .996 fielding percentage in 43 games caught ... made just one error in 308.2 innings ... threw out eight of 34 baserunners (23.5%) and posted a 4.11 catcher ERA ... Overall, hit .262 with five doubles, a triple, seven RBI and 13 walks in 18 games with Triple-AAlbuquerque. Batted .256 with three homers and 22 RBI in 57 games with Single-A Vero Beach...walked nearly as many times (22) as he struck out (26). Hit .219 with two homers and 22 RBI in 40 games with Single-A Vero Beach...walked more times (24) than he struck out (20). Played just three games with South Georgia of the Single-A South Atlantic League, going hitless in six at-bats, before being placed on the disabled list with a fractured left hand. October 29, 2018 C A.J. Ellis elected free agency. March 28, 2018 San Diego Padres selected the contract of C A.J. Ellis from El Paso Chihuahuas. February 18, 2018 C A.J. Ellis assigned to El Paso Chihuahuas. 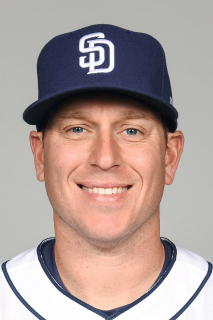 February 15, 2018 San Diego Padres signed free agent C A.J. Ellis to a minor league contract and invited him to spring training. November 2, 2017 C A.J. Ellis elected free agency. December 12, 2016 Miami Marlins signed free agent C A.J. Ellis. November 3, 2016 C A.J. Ellis elected free agency. August 27, 2016 Philadelphia Phillies activated C A.J. Ellis. August 25, 2016 Philadelphia Phillies traded cash and C Carlos Ruiz to Los Angeles Dodgers for Player To Be Named Later, C A.J. Ellis and RHP Tommy Bergjans. August 4, 2015 Los Angeles Dodgers activated C A.J. Ellis from the 15-day disabled list. July 20, 2015 Los Angeles Dodgers placed C A.J. Ellis on the 15-day disabled list. Right knee inflammation. June 13, 2014 Los Angeles Dodgers activated C A.J. Ellis from the 15-day disabled list. May 26, 2014 Los Angeles Dodgers placed C A.J. Ellis on the 15-day disabled list retroactive to May 25, 2014. Right ankle sprain. May 14, 2014 Los Angeles Dodgers activated C A.J. Ellis from the 15-day disabled list. May 11, 2014 Los Angeles Dodgers sent C A.J. Ellis on a rehab assignment to Albuquerque Isotopes. April 8, 2014 Los Angeles Dodgers placed C A.J. Ellis on the 15-day disabled list retroactive to April 6, 2014. Left knee surgery. June 14, 2013 Los Angeles Dodgers activated C A.J. Ellis from the 15-day disabled list. June 11, 2013 Los Angeles Dodgers sent C A.J. Ellis on a rehab assignment to Rancho Cucamonga Quakes. June 2, 2013 Los Angeles Dodgers placed C A.J. Ellis on the 15-day disabled list retroactive to May 30, 2013. Left oblique strain. August 23, 2011 Los Angeles Dodgers recalled A.J. Ellis from Albuquerque Isotopes. July 14, 2011 Los Angeles Dodgers optioned A.J. Ellis to Albuquerque Isotopes. June 19, 2011 Los Angeles Dodgers recalled A.J. Ellis from Albuquerque Isotopes. April 25, 2011 Los Angeles Dodgers optioned A.J. Ellis to Albuquerque Isotopes. September 3, 2010 Los Angeles Dodgers recalled A.J. Ellis from Albuquerque Isotopes. August 24, 2010 Los Angeles Dodgers optioned A.J. Ellis to Albuquerque Isotopes. August 4, 2010 Los Angeles Dodgers recalled A.J. Ellis from Albuquerque Isotopes. July 21, 2010 Los Angeles Dodgers optioned A.J. Ellis to Albuquerque Isotopes. April 10, 2010 Los Angeles Dodgers recalled A.J. Ellis from Albuquerque Isotopes. April 4, 2010 Los Angeles Dodgers optioned A.J. Ellis to Albuquerque Isotopes. October 26, 2009 A.J. Ellis roster status changed by Los Angeles Dodgers. October 7, 2009 Los Angeles Dodgers reassigned C A.J. Ellis to the minor leagues. September 1, 2009 Los Angeles Dodgers recalled C A.J. Ellis from Albuquerque Isotopes. July 2, 2009 Los Angeles Dodgers optioned A.J. Ellis to Albuquerque Isotopes. June 15, 2009 Los Angeles Dodgers recalled A.J. Ellis from Albuquerque Isotopes. June 1, 2009 Los Angeles Dodgers optioned A.J. Ellis to Albuquerque Isotopes. May 29, 2009 Los Angeles Dodgers recalled A.J. Ellis from Albuquerque Isotopes.